Burung Common Chiffchaff adalah spesies burung yang masih sejenis dengan burung cikrak daun maupun cikrak pallas yang dapat dijumpai di Indonesia.Burung ini memiliki ukuran tubuh yang kecil,suara lantang.Berikut ini deskripsi singkat tentang burung common chiffcaff berdasarkan wikipedia.Mohon maaf admin satu sedang malas translate,gak usah dibaca saja,dengarkan suara kicaunya langsung gulir cursor kebawah. The common chiffchaff, or simply the chiffchaff, (Phylloscopus collybita) is a common and widespread leaf warbler which breeds in open woodlands throughout northern and temperate Europe and Asia. It is a migratory passerine which winters in southern and western Europe, southern Asia and north Africa. Greenish-brown above and off-white below, it is named onomatopoeically for its simple chiff-chaff song. It has a number of subspecies, some of which are now treated as full species. The female builds a domed nest on or near the ground, and assumes most of the responsibility for brooding and feeding the chicks, whilst the male has little involvement in nesting, but defends his territory against rivals, and attacks potential predators. A small insectivorous bird, it is subject to predation by mammals, such as cats and mustelids, and birds, particularly hawks of the genus Accipiter. Its large range and population mean that its status is secure, although one subspecies is probably extinct. 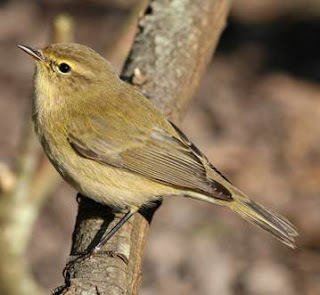 The common chiffchaff is a small, dumpy, 10–12 centimetres (4 in) long leaf warbler. The male weighs 7–8 grammes (0.28–0.31 oz), and the female 6–7 grammes (0.25–0.28 oz). The spring adult of the western nominate subspecies P. c. collybita has brown-washed dull green upperparts, off-white underparts becoming yellowish on the flanks, and a short whitish supercilium. It has dark legs, a fine dark bill, and short primary projection (extension of the flight feathers beyond the folded wing). As the plumage wears, it gets duller and browner, and the yellow on the flanks tends to be lost, but after the breeding season there is a prolonged complete moult before migration. The newly fledged juvenile is browner above than the adult, with yellow-white underparts, but moults about 10 weeks after acquiring its first plumage. After moulting, both the adult and the juvenile have brighter and greener upperparts and a paler supercilium. This warbler gets its name from its simple distinctive song, a repetitive cheerful chiff-chaff. This song is one of the first avian signs that spring has returned. Its call is a hweet, less disyllabic than the hooeet of the willow warbler or hu-it of the western Bonelli's warbler.The song differs from that of the Iberian chiffchaff, which has a shorter djup djup djup wheep wheep chittichittichiittichitta. However, mixed singers occur in the hybridisation zone and elsewhere, and can be difficult to allocate to species. Suara burung ini keras dan hanya berupa suara-suara pangilan dengan sedikit vareasi sehingga terdengar monoton.Silahkan dengarkan audionya dibawah ini. Maaf om,sedang banyak kerjaan,mohon dimaklumi hehee. 0 Komentar untuk "Common Chiffchaff Sounds"